Weather is defined as the atmospheric conditions at a particular time and place; climate is the average weather conditions for a given region over time. Weather conditions include temperature, wind, cloud cover, and precipitation, such as rain or snow. Good weather is generally associated with high-pressure areas, where air is sinking. Cloudy, wet, changeable weather is common in low-pressure zones with rising, unstable air. But long-term weather prediction is unreliable as shown in the Chaos Theory. Weather occurs near the surface of the Earth, where the atmosphere is dense and heavy. Heat from the Sun is responsible to mix the air to make weather. All weather changes are brought about by temperature changes (temperature gradient) in different parts of the atmosphere. The air at the equator receives much more heat than the air at the poles. Therefore, warm air at the equator rises and is replaced by colder air flowing in from north and south. The warm, lighter air rises and moves poleward high above the Earth. As it cools, it sinks, replacing the cool surface air which has moved toward the equator. 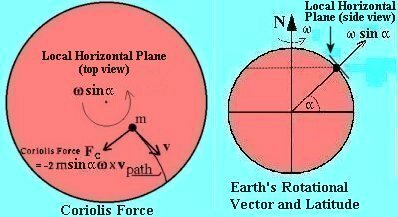 If the Earth does not rotate, the air would circulate as shown in Figure 09-09a. The Coriolis force associated with the Earth's rotation has modified the circulation pattern to the one shown in Figure 09-09b. For example, general air movements in the Northern Hemisphere begin with air moving north high above the equator, and slowly shifting toward the east because of the Earth's rotation. By the time this upper air has gone about 1/3 of the way, it is moving eastward. As more air piling up in this latitude of 30o, it forms an area of high pressure. Some air is forced down to the surface. One portion flows southward, turning west as it goes. It forms the "trade winds" that blow rather steadily from the northeast marking a popular route for sailing (trading) vessels. Skies are clear near latitude 30o but cloudiness and heavy, frequent, showery rainfall occur nearer the equator. The other portion of the mid latitude downward flow moves north and is deflected to the east forming the prevailing westerlies. At latitude 30o the air is calm and sailing ships often stalled at sea, which sometimes littered with starved horses (dumped from trading ships) - and hence the name: Horse Latitude. Another calm region is in the equator. From the rising moist air of this region tropical typhoons, or hurricanes, are born in the summer. Anyway, some of the high air at latitude 30o continues its northward flow. The air becomes very cold (via radiative heat loss) by the time it reaches the North Pole region. The cold air sinks and moves southward on the surface, shifting toward the west - this is the polar easterlies. At about latitude 60o, it runs into the prevailing westerlies traveling northeast. The line of collision is called the "polar front", which is the source of much of the changing weather in the United States. The movements of the large air masses are controlled primarily by the strong winds that blow continually at high altitudes. 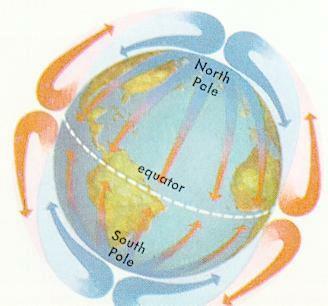 Around the polar low, the atmospheric circulation is counterclockwise (toward the pole and then up, see Figure 09-09b). This upper-air westerlies do not move along circular paths; instead, they meander north and south in a wavy patterns. The high pressure front acts like a wall to control the flow and the Coriolis force deflects the air movement toward the east. They are particularly well developed in the altitude range from 10 to 12 km, where a narrow band of air moves with speeds of 350 to 450 km/hr. This high-speed river of air is called the jet stream (Figure 09-09c), which separates the cold and warm air masses. Weather condition is very different from one side of the jet stream to the other. 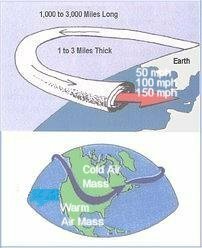 An air mass is a vast body of air (often covering several thousands of km2 wide and several km thick) in which the conditions of temperature and moisture are much the same at all points in a horizontal direction. It takes on these characteristics of the surface over which it forms. Air masses that affect the weather move across the country and carry with them the temperature and moisture of their origin. 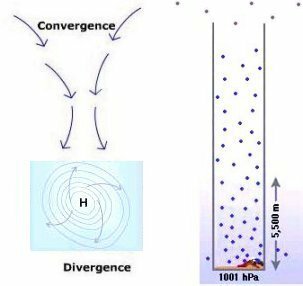 An air mass is modified by the surface over which it moves, but its original characteristics tend to persist. High-pressure ridges may develop any place where air cools, compresses, and sinks. Conversely, low-pressure cells form under the opposite conditions. The source of air mass usually originated in flat terrain with little wind and high pressure. Classification of air masses are based on: moisture - m for maritime, c for continental; and temperature - A for arctic (60o - 90o N), P for polar (40o - 60o N or S), T for tropical (15o - 35o N or S), E for equatorial (15o N - 15o S), and AA for antarctic (60o - 90o S). Thus the air masses can be classified into the following types. Figure 09-10 shows the distribution of the various types over the globe. is referred to as high pressure ridge in the weather map. Since the air at high altitude is dry, the High is usually associated with fair weather. At the hot spots on the Earth's surface, warm air rises up triggering surface air to rush in toward the core (Figure 09-11b). The Coriolis force now deflects the converging air in a counter clockwise circulation. Thus, a Low will develop when there is not enough infalling air to replace the rising air at the center. 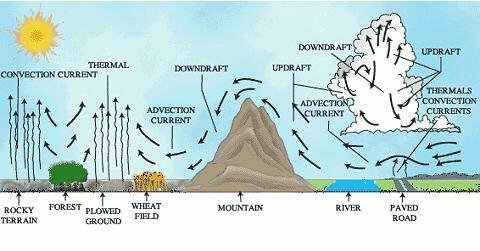 The rising air eventually dissipates at high altitude as high level wind or returning to the surface in cyclic motion. When the circular region of low pressure elongates to a long and narrow band, it is referred to as a low pressure trough. Since the warm air contains lot of moisture, Lows are usually associated the stormy weather as the vapor condensed at upper level. Low pressure cells that travel long distances across the Earth are called cyclones. 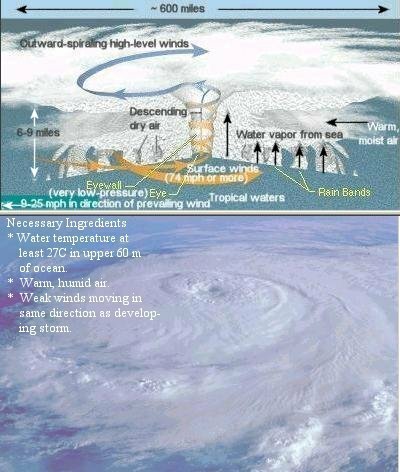 In extreme cases over warm tropical waters, they become hurricanes or typhoons. Fronts form at the boundary when air masses collide. The colder air mass pushes under the warm one and lifts it. Then, if the boundary doesn't move, the front becomes stationary. Usually, it does move, and one air mass pushes the other along. If the cold mass pushes the warm air back, it is called a cold front. If the cold air retreats with the warm air pushing over it, it is called a warm front. In either case, frontal weather is either unsettled or stormy. Fronts usually bring bad weather. Fronts form at margins of high-pressure cells. Fronts form only between cells of different temperatures. Warm air always slopes upward over cold air. 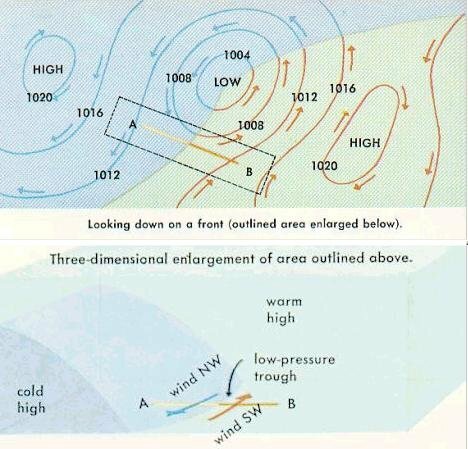 A front is found along a low-pressure trough, so pressure drops as the front approaches, rises after it passes. 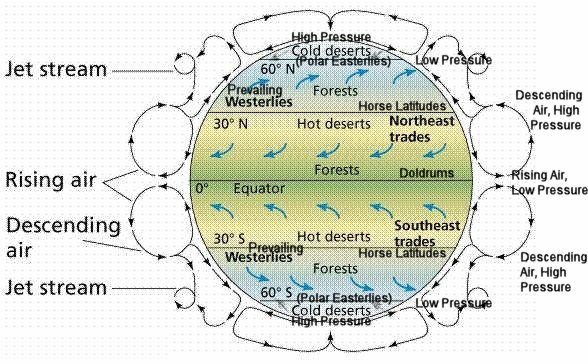 Wind near ground always shifts clockwise (in the northern hemisphere) as the front passes because air always flows clockwise around the high and counter-clockwise around the low. usually advance at speeds of about 30 km/hr (faster in winter). Although the sloping edge of a cold front may extend over several hundred kilometers horizontally, the steepness of the advancing edge means that frontal weather is limited to an extremely narrow band. Storms at a cold front are generally brief though violent. Occluded front is the result of cold front catching up with warm front. The warm air is forced up away from ground level (see diagram f in Figure 09-13 or its animated version). Squall lines may precede fast-moving cold fronts. They are unborken line of black, ominous clouds, towering 15 km or more into the sky, including violent thunder-storms and occasional tornadoes. Squall lines occur when winds above a cold front, moving in the same direction as the front's advance, prevent the lifting of a warm air mass. But 150 to 250 km ahead of the front the strong winds force up the warm air with almost explosive violence, producing the squall line. Weather at slowly moving cold fronts differs from weather accompanying rapidly moving fronts depending on whether the warm air is stable or not. Unstable warm air develops where the ground temperature is higher than the air's. 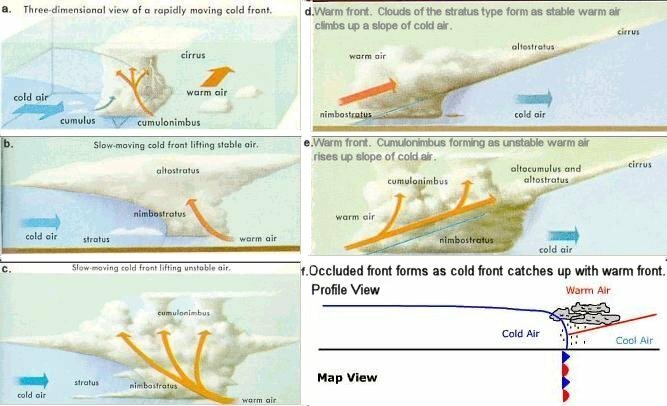 If the warm front is stable, nimbostratus will form almost directly over the front's contact with the ground, and rain will fall through the cold mass after the front has passed. If unstable and very humid air is pushed over a slowly moving cold front, cumulonimbus clouds will form and thundershowers may fall. 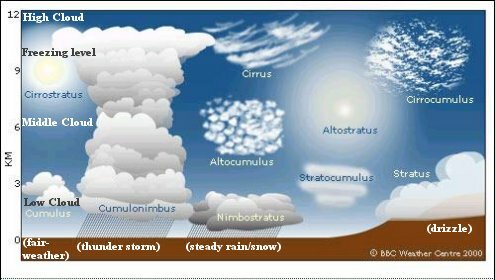 But the chief rainfall will be a steady downpour from numbostratus clouds at the lower levels alternates with rain in sheets from cumulonimbus clouds towering above (see diagram b, c in Figure 09-13). Warm fronts lift the stable warm air over the cold one. As the air lifts, it cools to produce stratus, numbostratus, alto- stratus, cirrostratus, and cirrus clouds in that order. Precipitation is heavy at the beginning of the lift, but decreases gradually, leaving relatively dry cirrus clouds at 6 km or higher (see diagram d in Figure 09-13). 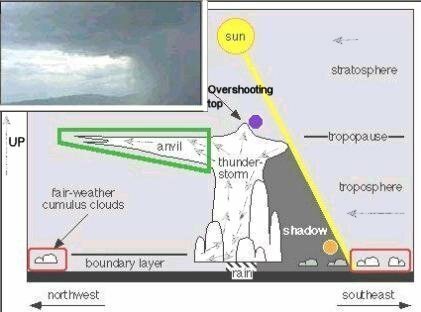 Unstable warm air produces more violent weather creating cumulonimbus clouds and thunderstorms ahead of the front line (see diagram e in Figure 09-13). 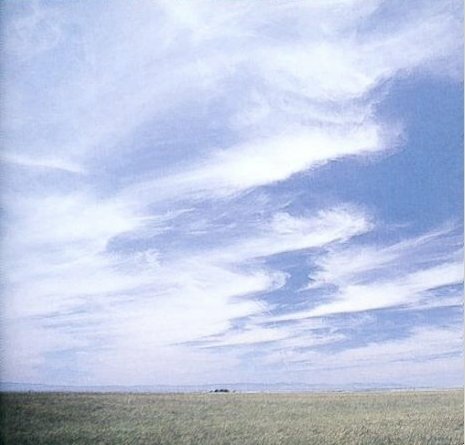 Cirrus - They are usually thin, white, and feathery. Its presence indicates significant amount of moisture at high altitudes, and serves as a warning that a warm front is on its way, bringing steady rain. Alto - These are middle-level clouds. The air at these altitudes is generally stable and without vertical currents. The two principal types are altocumulus (fluffy) and altostratus (layered). Small and temporary altocumulus usually do not associate with an organized weather system or flow of moisture into the area. Only when altocumulus cover a larger area for a longer period of time, then it indicates a more significant source of moisture is present. 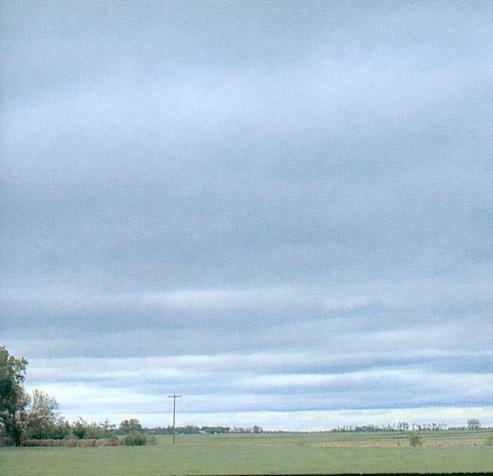 Stratus - They are layered and usually gray occurring at medium and low altitudes. Stratus clouds usually yield no precipitation other than drizzle, ice crystals, steady rain, or snow grains. Sometimes they resemble fog, except the clouds are above the ground with the base as low as just above the treetops. There are many variations: opacus nebulosus and opacus uniformis (dark and without features); undulatus (simple linear structure); and translucidus (thin stratus). Cumulus (pile in Latin) - They are fluffy and lumpy clouds at medium and low altitudes. The presence of cumulus clouds is a sign of fine weather in the region. 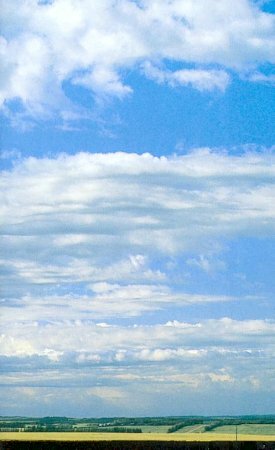 Shallow, vertical cumulus clouds are made when warm air raised, reaches its dew point, and then condenses. They appear light in color and have flat bases and rounded tops. Nimbus - Nimbus are rain clouds at low altitudes. Nimbostratus are dark gray to pale blue water-droplet precipitation clouds with noticeable blurring in the area below cloud base (caused by falling precipitation). They occur all year round. Cumulonimbus are highly organized clouds make up of water droplets in lower portions, and ice particles in upper portions, with dark bases and with precipitation falling from them. They carry the thunder storms in the summer. 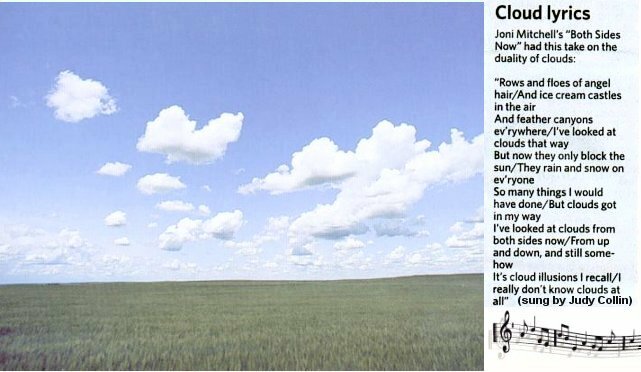 As mentioned above, further division is made into types such as cirrostratus and cumulonimbus in order to give a more detailed description of the cloud features. The highest clouds - those of the cirrus group - are composed chiefly of ice crystals. They are thin and wispy, and do not block the sunlight. The layered stratus clouds, on the other hand, tend to be much more dense and usually obscure the Sun. 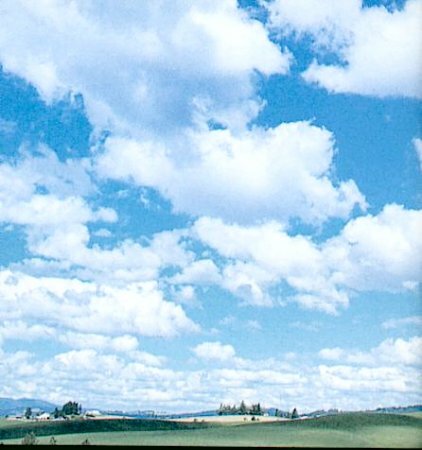 The fluffy, white low-altitude cumulus clouds are associated with good weather (see Figure 09-14b and hear cloud lyrics). The nimbostratus clouds, which also occur at low altitudes, are rain-bearing clouds. The most spectacular of all cloud formations are the towering cumulonimbus clouds, which develop during thunderstorm activity and rise to great heights. 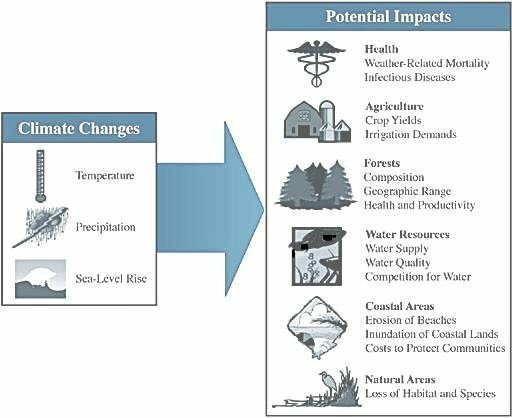 Geographical, biological, and man-made factors often make local climatic conditions different from the general pattern. For examples, large lakes moderate temperature extremes; plants create microclimatic differences by their use of water and by their effect on winds; valleys and hills produce difference in temperature, wind speed, and condensations; city is warmer and less windy than countryside. All these local variations alter the movement of air as shown in Figure 09-15. They produce local weather conditions not following the general patterns. two attributes are related. It also shows that the most recent increases are occurring at rates that have not been observed since the end of the last ice age and have only previously been observed in association with dramatic shifts in climate. It is generally assumed the dramatic increase in carbon dioxide concentration in the atmosphere over the past 150 years is largely due to anthropogenic (human-caused) effects. Human beings are causing the release of carbon dioxide and other greenhouse gases to the atmosphere at rates much faster than the earth can recycle them. Fossil fuels - oil, coal, natural gas, and their derivatives - are formed through the compression of organic (once living) material for millions of years, and we are burning billions of tons of these fuels per year. 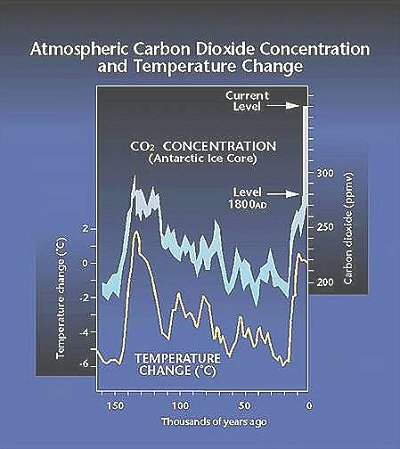 The CO2 expelled into the atmosphere through these activities does not disappear immediately or even over the course of a year. As a matter of fact, the residence times of greenhouse gases (how long they remain in the atmosphere) are on the order of decades to centuries. This means that the impact will be accumulated well into the future of many generations. over the past century. Worldwide precipitation over land has increased by about one percent. The frequency of extreme rainfall events has increased throughout much of the United States. Figure 09-17b shows the greenhouse effect from human activities (agriculture, industrialization) warded off a glaciation that otherwise would have begun about 5000 years ago. 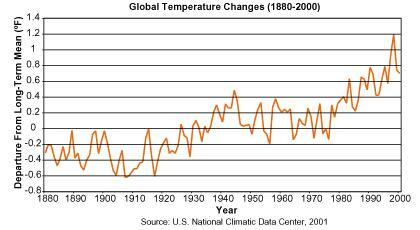 For more details on global warming, go to the 2007 IPCC (Intergovernmental Panel on Climate Change) website. There is no unanimous agreement on the cause of glaciation. One explanation involves plate tectonics. 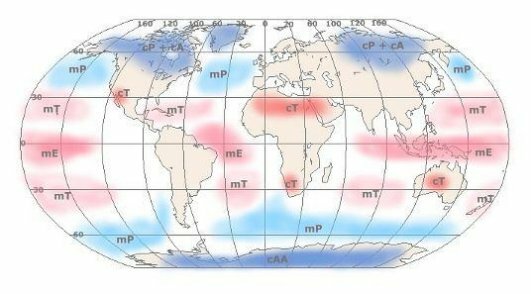 The movement of landmass to higher latitudes from tropical regions is responsible. 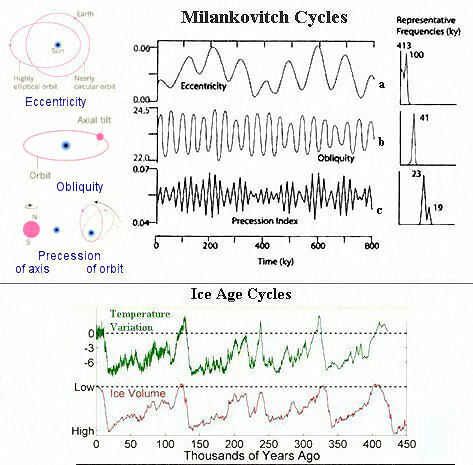 Another explanation is known as the Milankovitch cycle (Figure 09-17c). It describes the way Earth's orbit gradually changes shape from a circle to a slight ellipse (eccentricity, curve a) and back again roughly every 100,000 years in exact agreement with the period between ice ages. Other causes include the tilt of the Earth's axis (obliquity, curve b), which takes 41,000 years to complete a cycle; and the top-like wobble (precession, curve c) of the Earth's axis, which follows a 23,000-year cycle. These other effects generate the secondary variations within the main cycles. 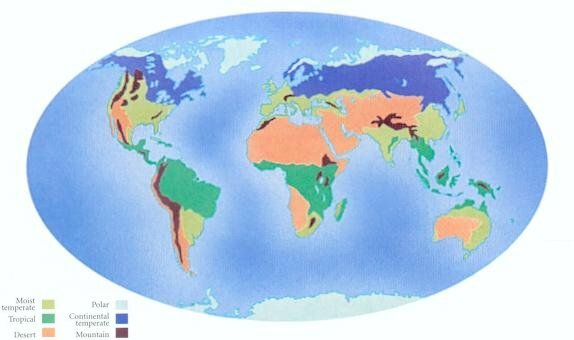 Figure 09-17d below shows climate fluctuations over the eons (in terms of millions of years). Although the Earth's early temperature record is quite uncertain, good estimates can be made starting 400 million years ago, when fossils were more abundantly preserved. It seems that the diversification of life follows closely with warming climate outside the four major glaciations - starting from algae, stromatolites, jellyfish, spingy fish, then ichthyostega (the first land animal), followed by the rise and fall of the dinosaurs, finally ushering in the age of mammals.